Safer Internet Day, Tuesday 5th of February, is a time to reflect on the ways in which we all use the Internet, and how we can make conscious decisions to be safer online – both personally and at work. This year’s theme, ‘Together for a better Internet’ focuses particularly on taking steps to start creating a better and safer Internet for ourselves and others. Since its invention in 1989, the Internet has quickly grown to become an integral part of our lives with 88% of Australians, of all ages, actively using the Internet today. While its uses have become far-reaching and important for our day-to-day lives and the economy, there are risks to Internet use. Some examples relevant to individuals that come to mind include phishing, theft of personal information, spam, and cyber bullying, with more also applicable to the workplace too. With more and more sensitive information being created, used and shared online, an important part of creating a safer internet lies in how we protect and share our information. In recognition of this year’s Safer Internet Day, we are sharing (no pun intended) our top tips for safely creating, using and sharing information and documents online. Some of the largest and most trusted companies, organisations and government agencies have been hit by large-scale data breaches in recent years. 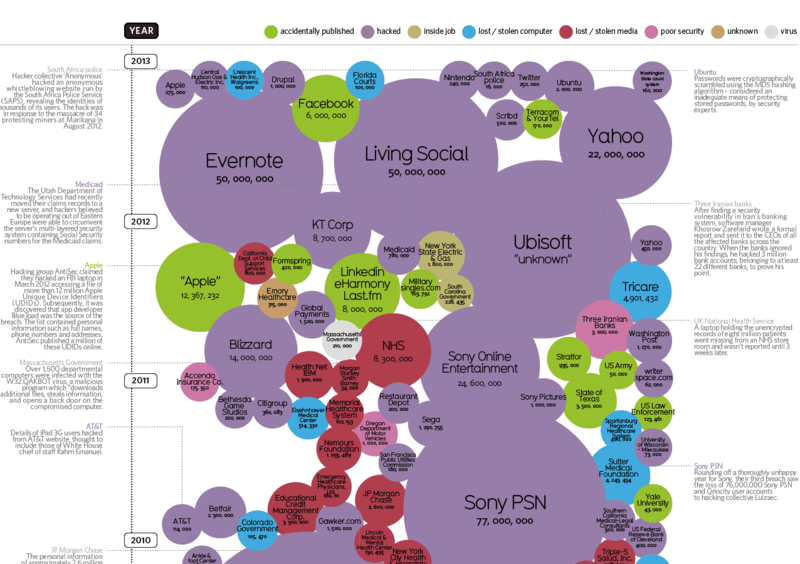 This infographic, created by David McCandles, shows just how large and far-reaching some of these breaches are. As increasingly more data is shared, more can, and will, fall into the wrong hands. Knowing the likelihood of information breaches helps to be more prepared and take a proactive approach to securing data. 2. Complex passwords are great, but two-factor authentication is better! It is common practice for companies to reject simple passwords, but adding another layer is becoming more and more necessary for keeping data safe. Two-factor-authentication is the process by which a connection can be verified by an alternate method as well as using a password. This can be done by sending an SMS code to a phone, enforcing security questions, biometrics such as fingerprints or voice recognition, or using a validated authenticator app that provides the user with a temporary access code. The cost of data breaches is huge and potentially dire for companies and organisations – As their data becomes an increasingly significant asset, that data also becomes a more significant target. In a yearly study conducted by Ponemon, the average cost of a data breach had grown by 6.4 percent between 2017 and 2018, rising to $3.86 million per breach. It stands to reasoning that investing in software, personnel and education to avoid or minimise impact of breaches is necessary for organisations, big or small. Exploring your options, and allocating resources to data security allows you to take a proactive approach to protecting your data. Data isn’t always taken against our will, sometimes it is shared by mistake. It is important we therefore take steps to avoid sharing information with the wrong people. For private use, this can mean ensuring that the sharing of your cloud based information is connected to the right people. Always double check your sharing and remove shares when no longer needed. For companies and organisations, an alternative is to use controlled solutions such as Attribute Based Access Management which make granular decision on the sharing of information via policy. Attribute Based Access Control (ABAC) allows users to clearly define, based on a set of attributes, who their documents and data are shared with at the granular level. Increasing awareness and using technology that allows users to define how and to who their documents are shared helps avoid information being shared with the wrong people. Attribute Based Access Control (ABAC) such as that used in Kojensi Gov, forms the basis of work by both archTIS and Axiomatics in effectively enabling organisations to use and share information in a trusted way. This is at the heart of information sharing. We need to trust in order to share, and share to ensure we’re approaching tasks, projects or critical situations with all the necessary information. We should equip ourselves with the necessary tools, software and knowledge, to be more comfortable to share. These top tips are a good place to start, but protecting ourselves and our information for a safer online experience is an ongoing process, which will always have new challenges. If you are interested in learning more about securely sharing information and the solutions that exist for your business problem, please get in contact. archTIS has over 12 years of experience working in the Top Secret space with clients such as the Australian Defence Force. We are happy to talk to you about the best solution for your specific information sharing business problem. In Q1 2019 archTIS will also be launching a new product, Kojensi Gov, designed to enable government agencies to securely share and collaborate on documents in the cloud, using dynamic access control. This will include many of the above principles, including two-factor authentication. For more information on Kojensi Gov, please visit the website.